oh wow! 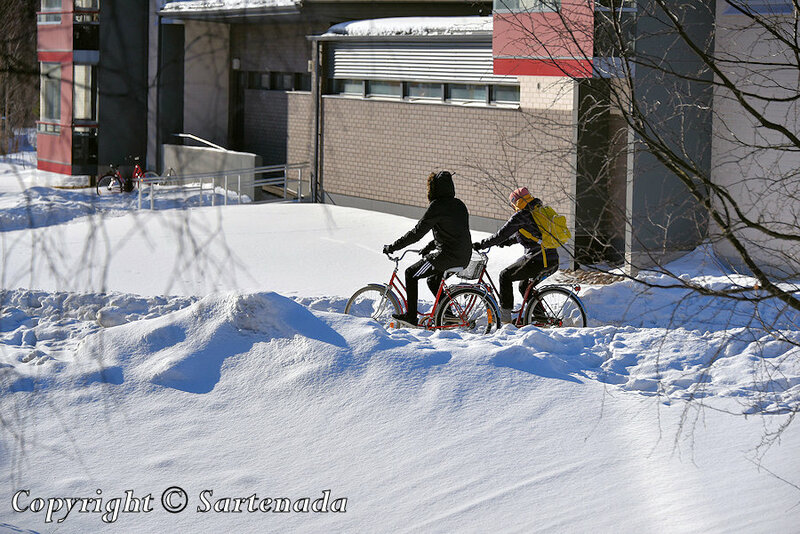 I had no idea that you could do cycling on the snow. As you say it is common in Finland. I would be too frightened that I would slide but I guess if there are studs on the tyres it would prevent that. Yes, studs are the key word. Thank You visiting my blog and commenting this post. This is soooo AWESOME!! I’m jealous. How nice to see that You loved this post! Thank You leaving Your kind comment. 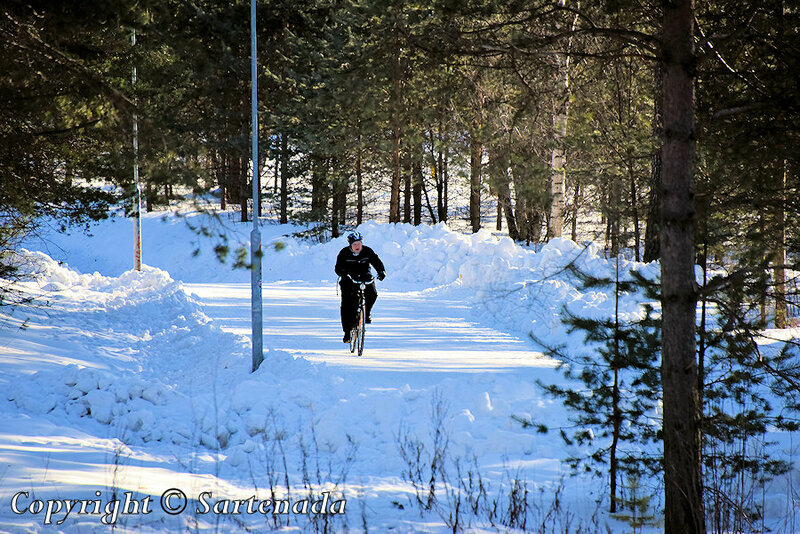 Cycling in the dead of winter can only happen in Finland! Great photos, my friend! 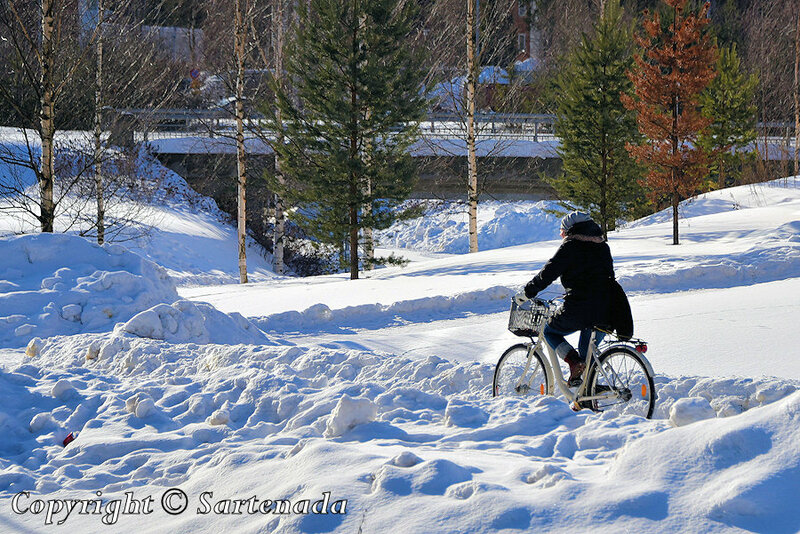 Yes, cycling at any time of the year and anywhere is possible in Finland. Thank You. I guess studs on the tires would be pretty much necessary. Yes, in winter everybody uses studs! Thank You leaving Your comment. When talking about Climate change, cycling is also a climate action. 🙂 Thank You. 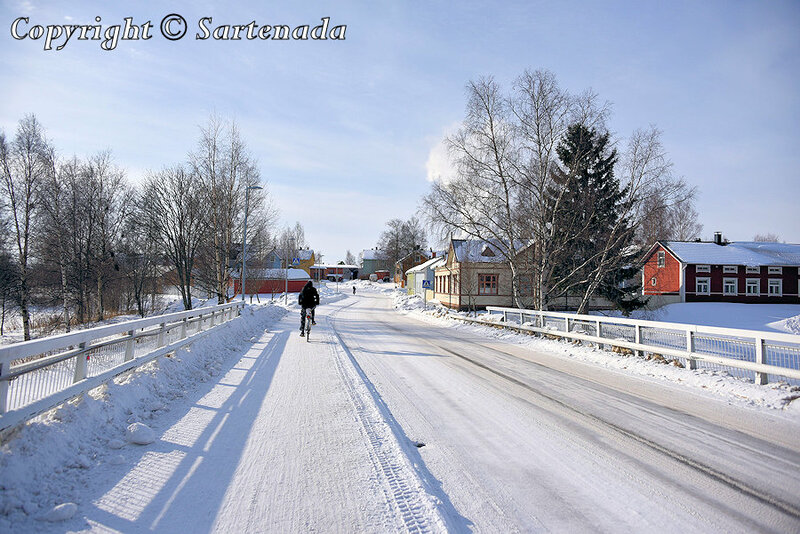 Beautiful winter cycling photos Matti. 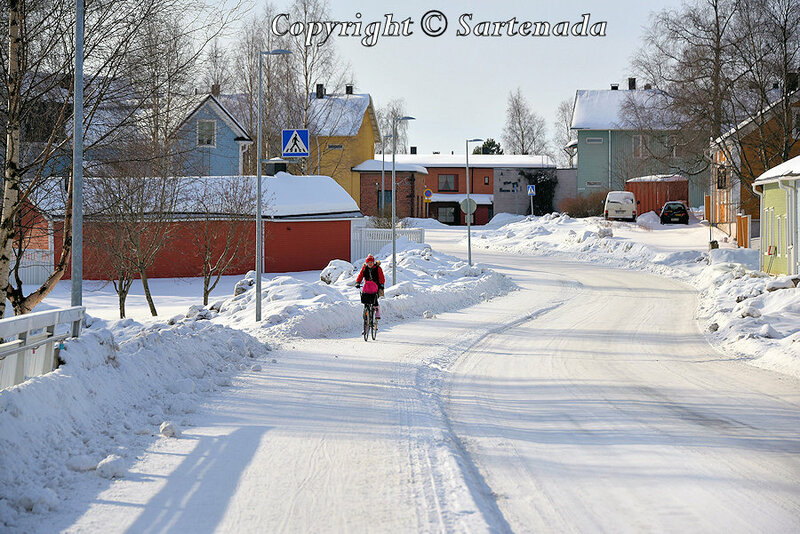 I saw quite a lot of people cycling in the snow last winter when I was in Tampere so the post brought back happy memories for me. Nice to read that You were there in Winter. Last time we were in Tampere October 5, 2018. We made a theatre weekend trip. Usually we visit theatres in other towns than Helsinki. In New year we were in Varkaus. Next time we will go to Pori theatre in April. Thank You commenting so nicely. 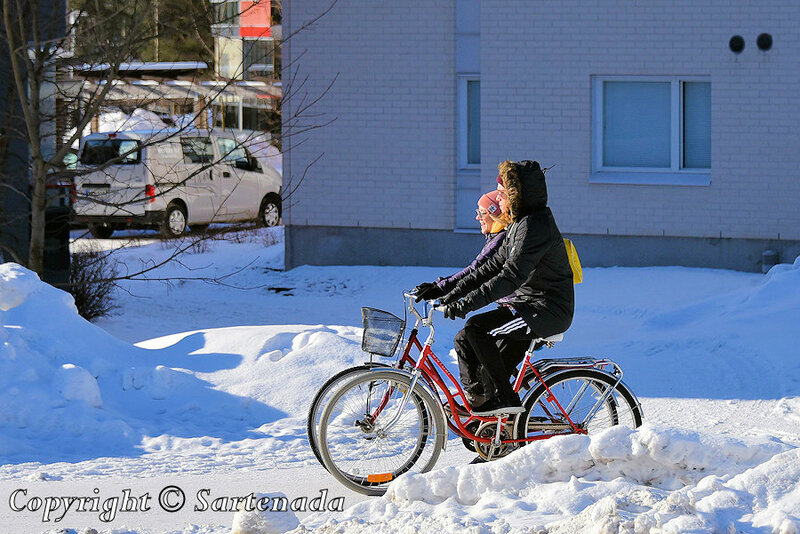 I never understood why people would cycle in the snow, but then I discovered that they have special snow tires for the bikes. However, it just seems like it would be too cold with the wind blowing in your face. Always cold weather is not cold, but adding the wind, then it feels really cold on the skin. Thank You leaving Your kind comment. Thank You commenting. I just checked actual weather: -9 centigrade. Last Year it was -19 Centigrade when shooting these photos. Wind was heavy, which made the real feel -29 Centigrade. 🙂 This means that man need good winter cloths. Fingers freeze easily when photographing. Therefore, I use gloves and mittens. Happily, there is very near library, where You can go to warm up. The coldest weather in which I have been was January 10, 1987, -34 Centigrade. It was cold and felt also. This looks fun 😀 Unless it is too windy I guess! Windy and maybe cold also, I think. Thank You commenting. O contraste do branco da neve com o colorido das pessoas e dos prédios cria fotos surpreendentes. Muito agradecido por seu comentário. Fico feliz que tenha gostado as minhas fotos. Hello! 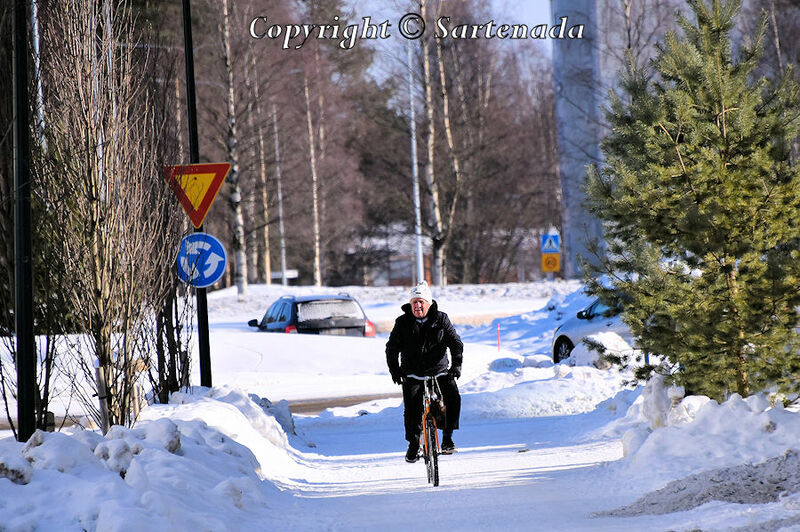 Winter cycling is natural in Finland? It is safe to have a long distance road that have been maintained. 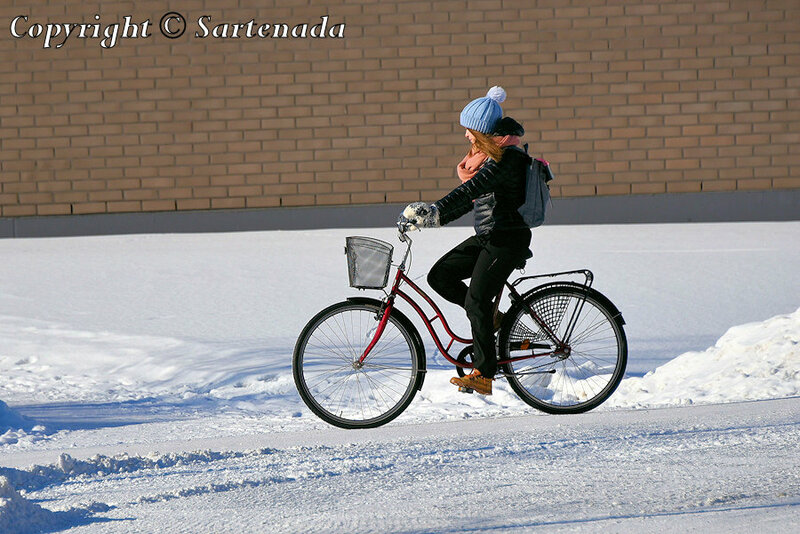 No roads are maintained for bicycles in Japan so nobody rides a bicycle if it snows in Japan. Have a good day! 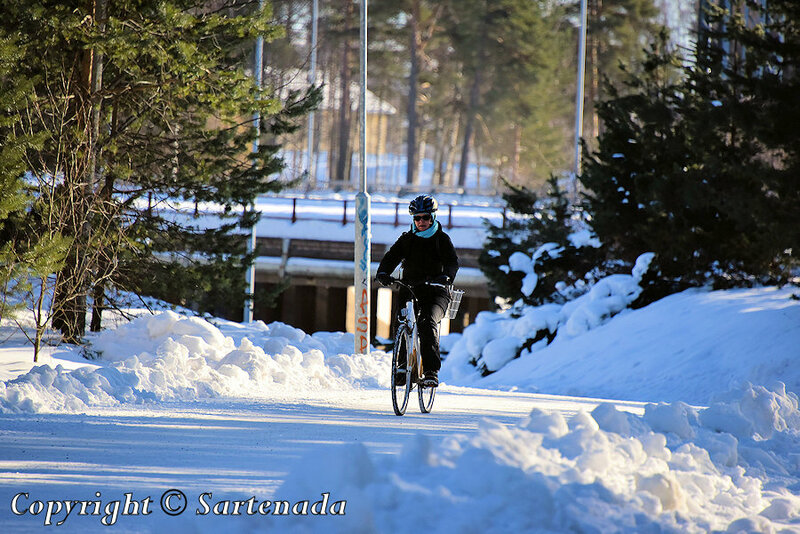 Winter cycling is natural and popular. 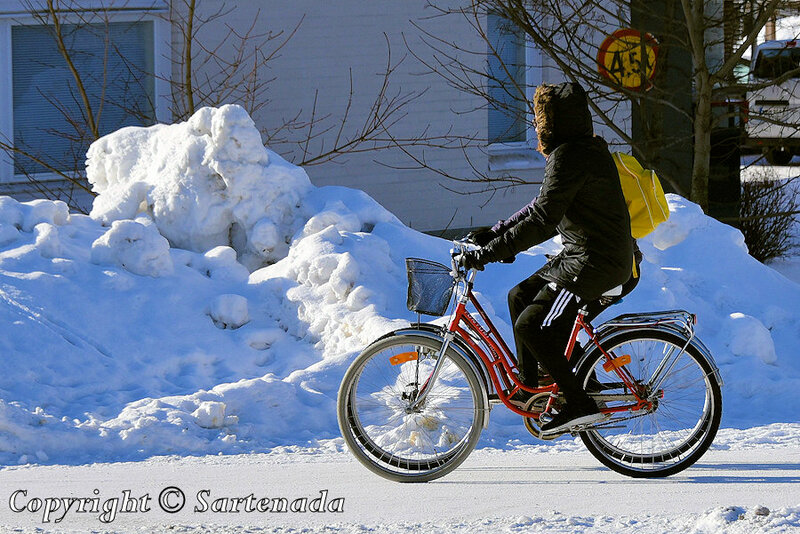 Oulu is the best winter biking town, also elsewhere in Finland people bikes in winter Helsinki including. Thank You commenting so nicely. 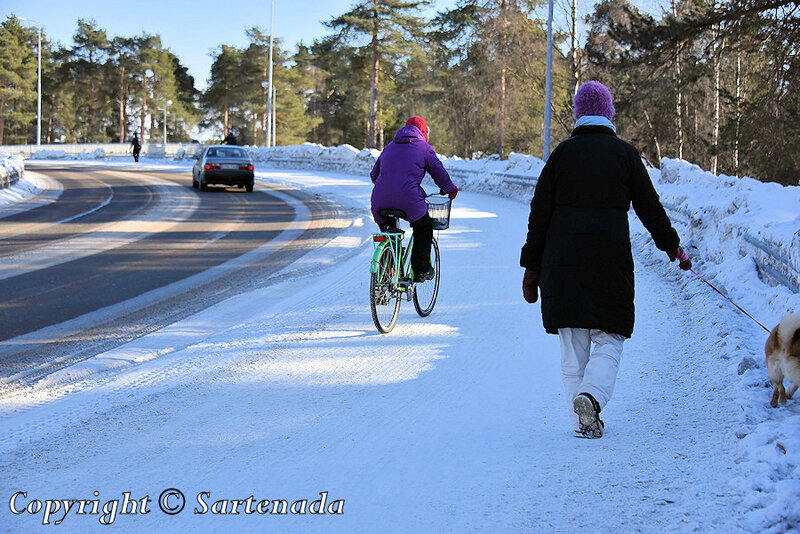 It’s wonderful to see so many people cycling in winter. The trails are very well-kept. 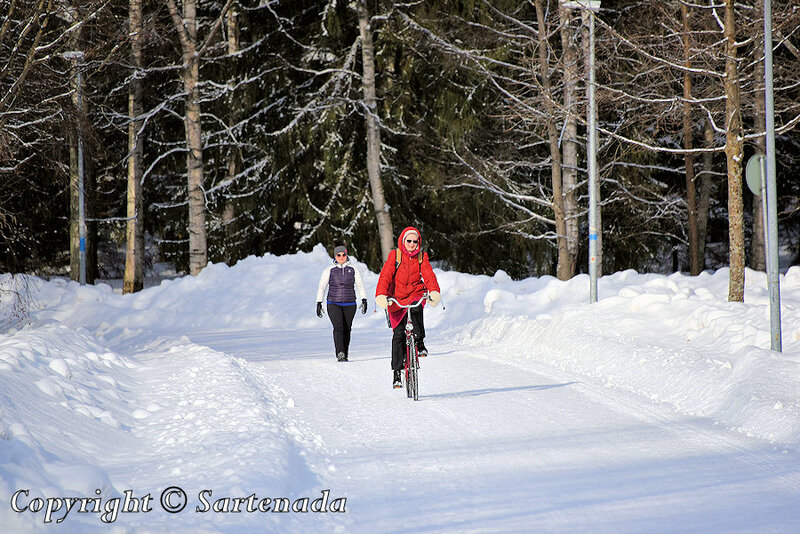 Cycling is good for the man – well, walking and hiking also. 🙂 Thank You leaving Your kind comment. Yes, okay. You must have noticed also that these bikes in my photo show ordinary bicycles, not brand-new top bikes. 🙂 Thank You. Thank You very much for Your praising words! There’s no way I can do that in Japan! Thank You for Your kind comment and information. 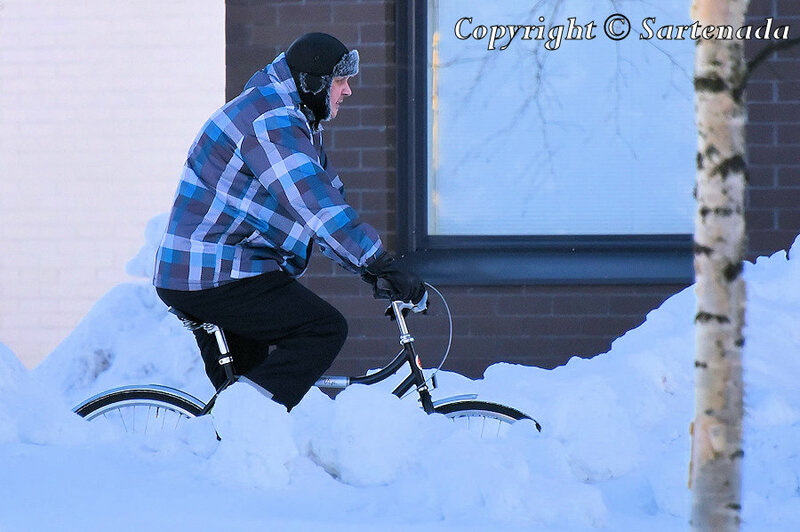 I would have to practise on a bike for a while before I was brave enough to try cycling in the snow. It looks like fun though. Thank You. 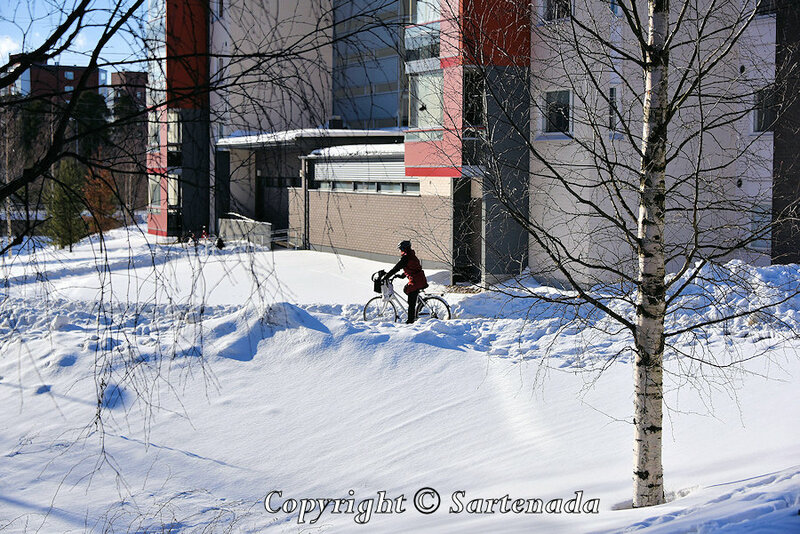 When I was school boy, I had to bike to school, was it winter or not-8 kilometers / 5 miles. Always it was not fun because it was a heavy to pedal because it was frozen. Warm and wind stopping cloths are useful. Of course, You can imagine if we know to make them. 🙂 Thank You for You kind comment. 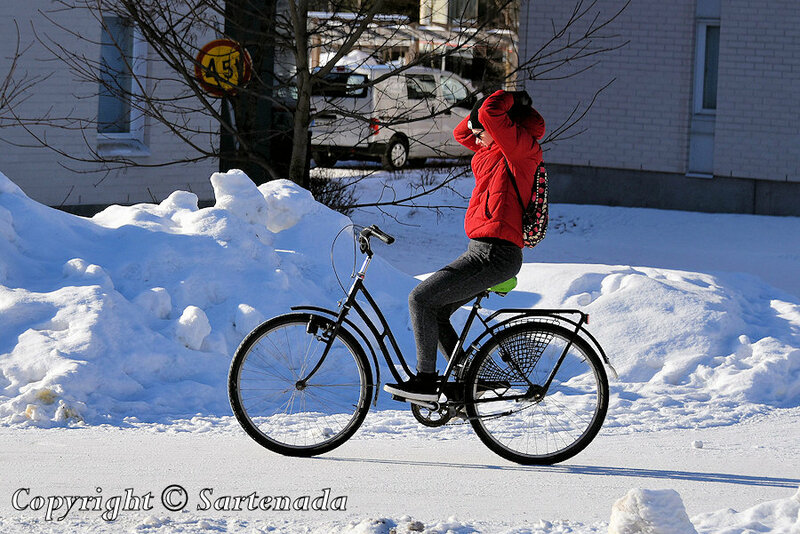 Where there are winter tires for bicycles popular there. In the area where I live there is a person who cyclists with summer tire specifications and it is dangerous. One person, who shows example – that is great. 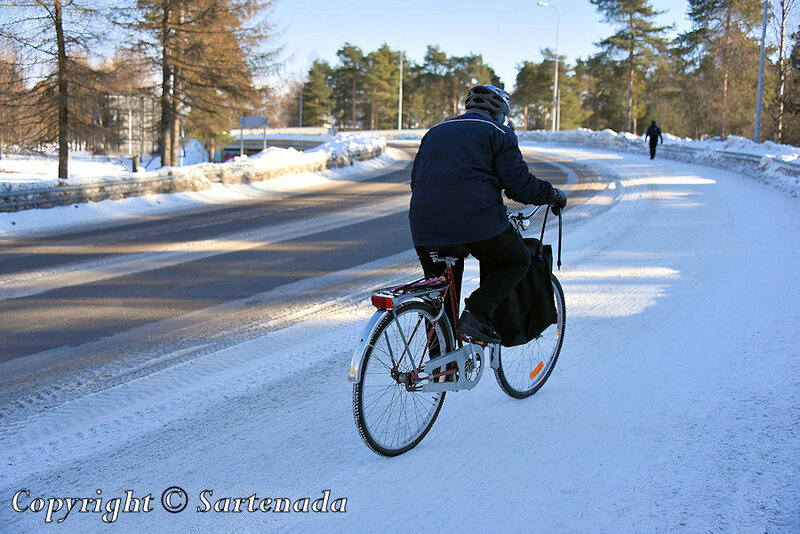 It is natural that in “warm” parts, people do not bike in winter. Here in my country there is a difference of people living in south or more in the north. In the north people living, are more hardener than those living in the south, I think. 🙂 Thank You. Looks cold and was also. 🙂 Cold in New York, sound cool, because New York is in the south: 40°42′46″N 74°00′21″W and Oulu: 65°01′N 025°28′E. There is a big difference! Thank You leaving Your kind comment. That’s great! Looks like it would be a lot of fun. Good that they clear off the bike paths so nicely. That 4-wheeler looks pretty cool! I am glad that You took a look at my winter photos and left Your comment. 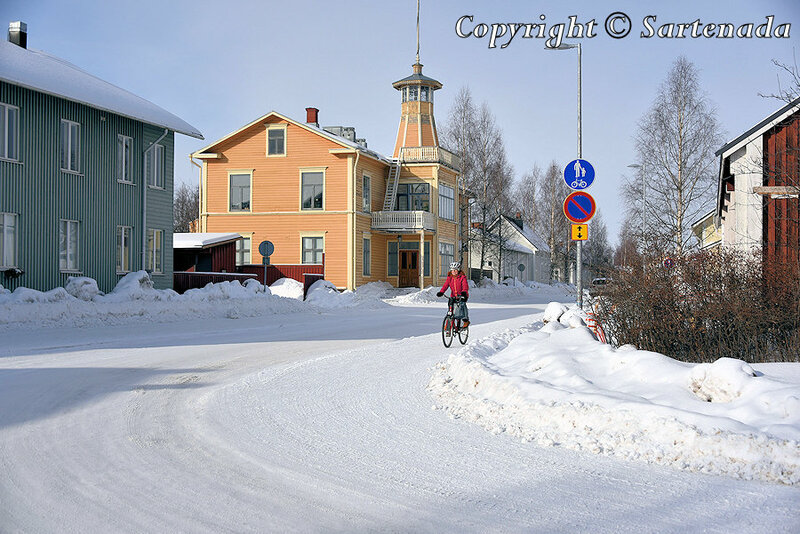 Oulu is fantastic town in Finland, although many people do not notice it when travelling to the north. Few stop in Oulu. Sigh. 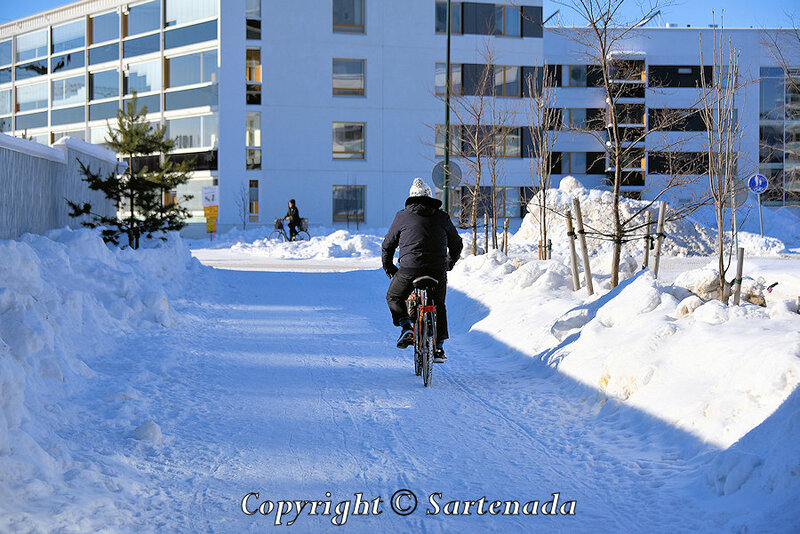 In Japan, it is alright to ride a bicycle on a snowy road. I guess that’s pretty familiar. It was a sight that I had not seen for me.Have a nice day! How nice comment to read. Thank you. I am glad that You loved my post and its photos. Thank You. Yes, I understand You very well. I am glad that You left Your kid comment and loved my photos. Wow! That must be a difficult workout. No, not at all! 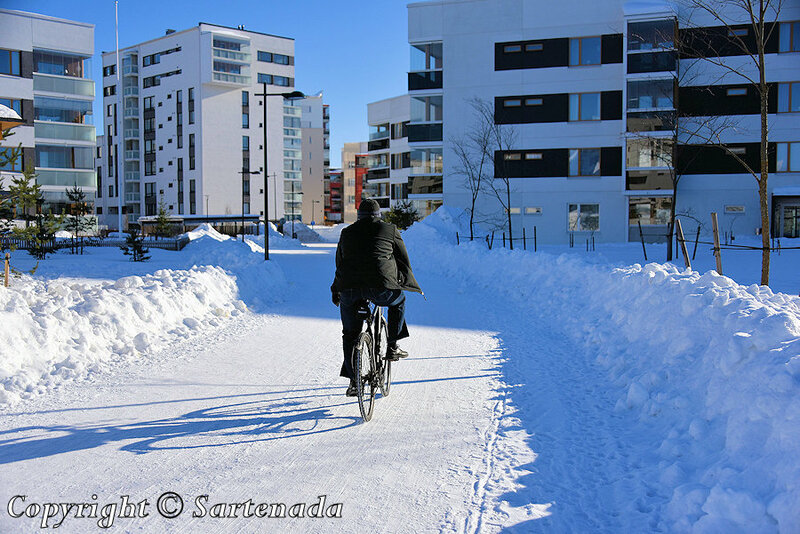 If it would be difficult, then people would not go to their work or shopping by bike! Thank You. What a wonderful collection of photos! If the roads in my city were that wide and that quiet, I might consider it too. Alas, we have a lot more cars here. Lovely to see your corner of the world, though! Oulu is one of my favorite town in Finland. 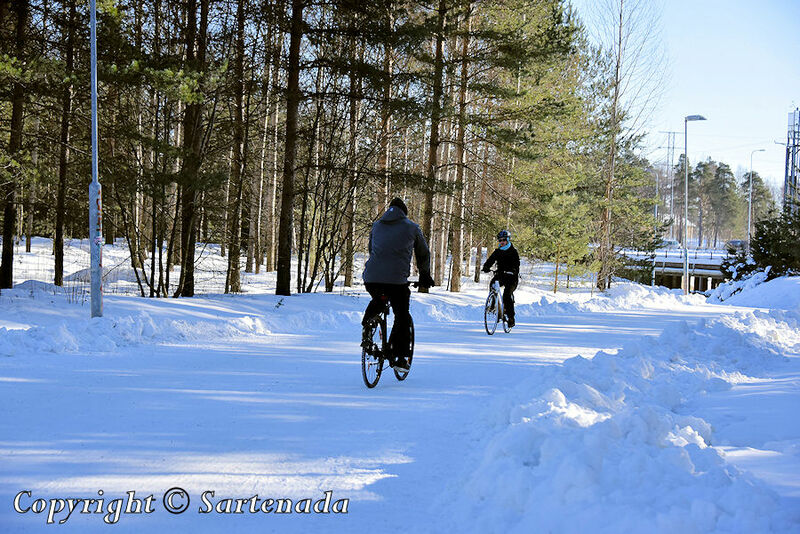 It offers winter fun for children and for adults. The main winter happening is reindeer race, in which everyone can participate and it is free! Next race is on this week on Saturday. We will visit it. Thank You for Your kind comment. How exciting that the next race is coming up! Remember to bring hand-warmers and an extra battery (as we’ve discussed in our previous comments). 🙂 Can’t wait to see your photos. It is Saturday morning and we are now in a well-equipped cottage in Oulu at camping site of Nallikari. We will spend here ten days. Driving from Helsinki took 8 hour and 50 minutes. The road conditions were terrible! Today seems to be good to walk to the reindeer carnivals. My posts will be from 2018. This means that photos which I today will shoot, I will present them next year. This is valid also my newt post which shows winter village for children, free reindeer rides for all families and free reindeer races for everybody. Last year was exception, because then I showed photos of world’s biggest snow castle from 2017 & 2018. The Lady in red is my wife and me in black is me in this post. This post shows nice set of photos during many years. I suggest You to check it! I’m glad to hear you made it safely in spite of the difficult driving conditions! And thank you for clarifying about the photos — I will wait patiently until you post them, then. In the meantime, what a treat it was to see your ice castle photos. Thank you so much for the link; you’ve absolutely blown my mind! Heide. My winter photos will end much later showing Santa, reindeer rides and inside photos the log cabin of Eleanora Roosevelt. Yup. Thank You for Your visit and comment. Wonderful fun! Keep healthy and ride! 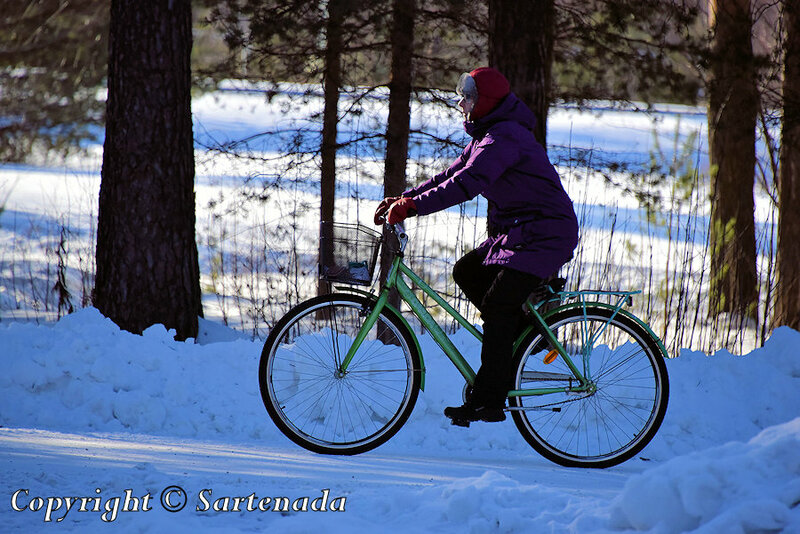 Oh cycling on snow! Healthy! My town have water shower on road. Thank You showing the link – fantastic photos. I am glad that You loved my post. J’aime aussi cette photo. Peut-être une photo parfaite. Je suis heureux que vous tu as donnée ton commentaire aimable. Merci beaucoup. What stunning photos, I love those blue skies against the white snow. 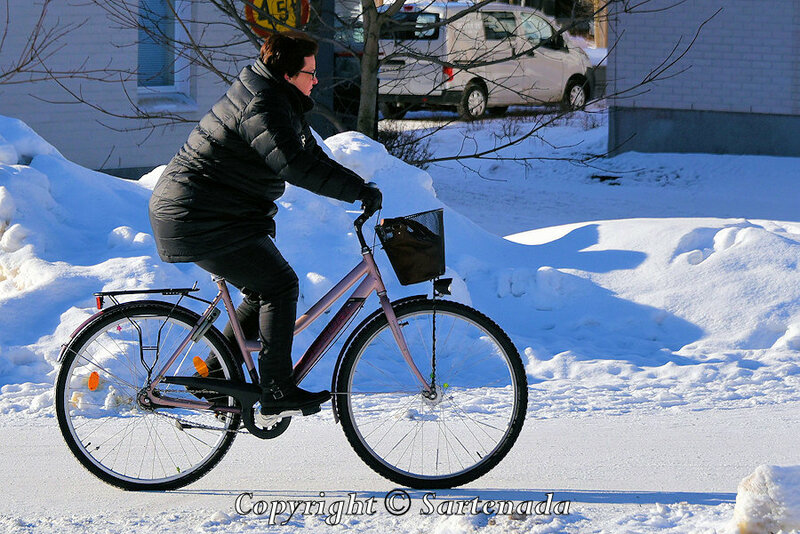 What a great idea, I didn’t even know one could get winter tires for bicycles. The best winter tires come from Finland, of course. Suomi brand (formerly Nokian) makes a variety of studded tires work that great on ice or hard packed snow. Fat tires (I’m told) work well on soft and deep snow. 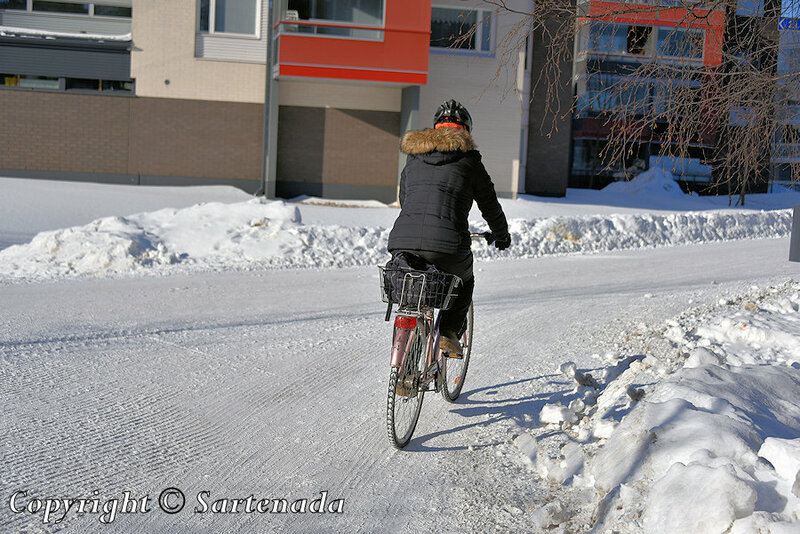 That is interesting, although I’m not a cycler, I do not notice Calgarians cycling in winter as much as they do in summer. We are fortunate to have a great network of trails. 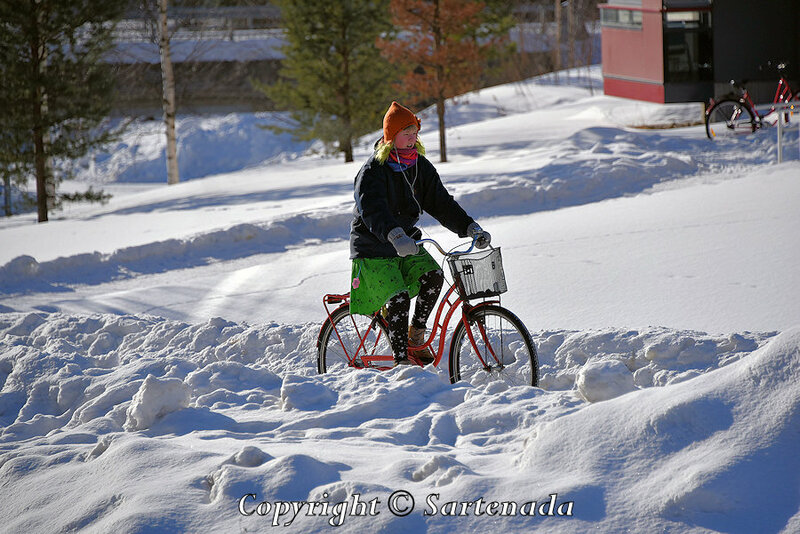 Linda, as You saw winter cycling is normal here. 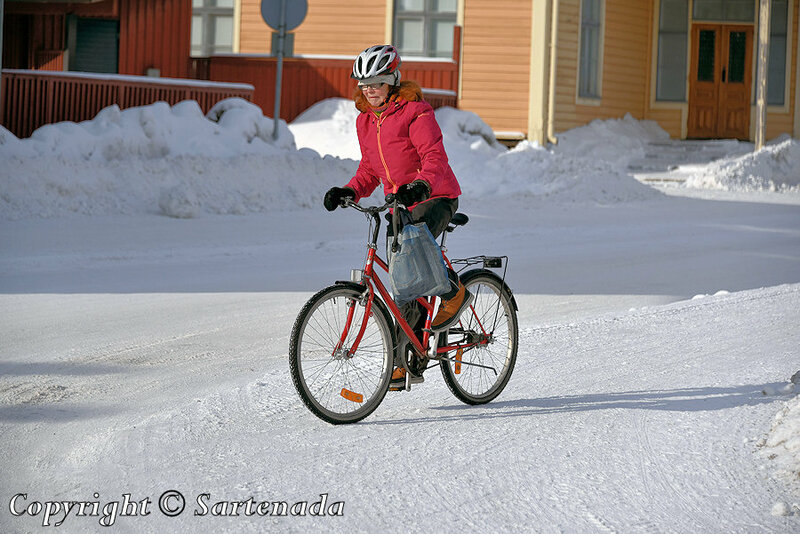 Oulu is the best biking town in Finland, Thank You. What a praising comment. I am glad that You left Your kind comment. Thank You. I am glad that You visited my blog and loved this post. Thank You. That is something I won’t see here in the south… As it is rare for it to snow around here. So enjoyed your photos though! Thank You loving my photos and having the information thru them that how our World differ in many parts of it. 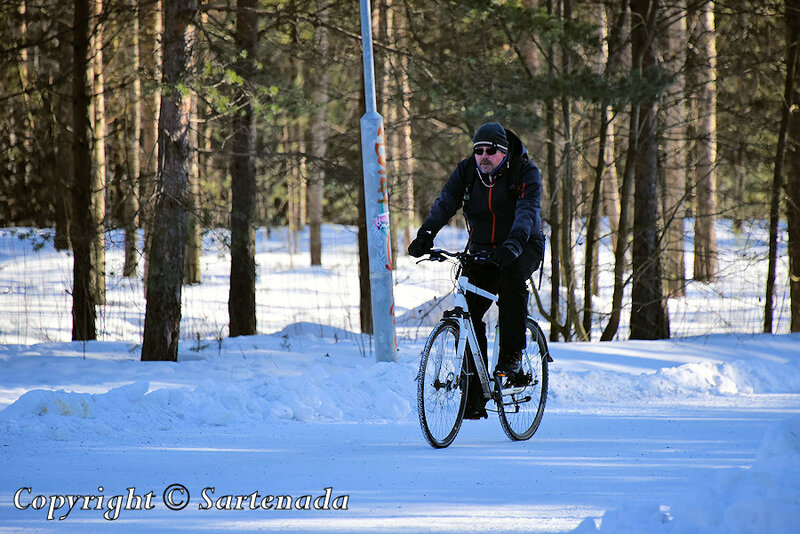 wow, les gens de ton pays sont bien équipés pour faire du vélo d’hiver. Ils peuvent profiter de toutes les saisons et jouir de l’hiver aussi. Je vous remercie vivement pour votre si gentil commentaire. Je suis content que vous ayez aimé mes photos. Merci beaucoup. Je souhaite une très bonne journée à vous. That’s pretty cold for biking. It never snows here in the other side of the continent but it would be pretty cool to try it one day on Snow. How nice it was to read Your kind comment. Thank You. 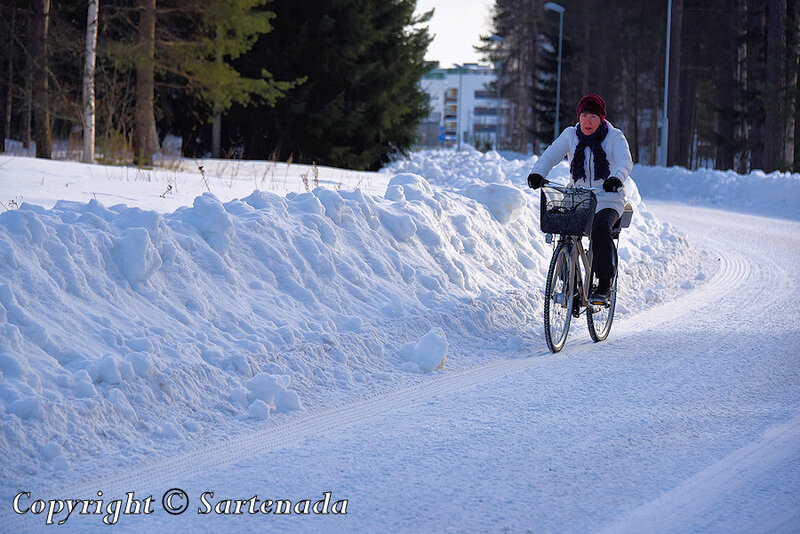 It’s great that so many people ride their bikes even in the winter. Interestingly, some of the tires don’t look sturdy enough, but I assume they still have a thick tread. 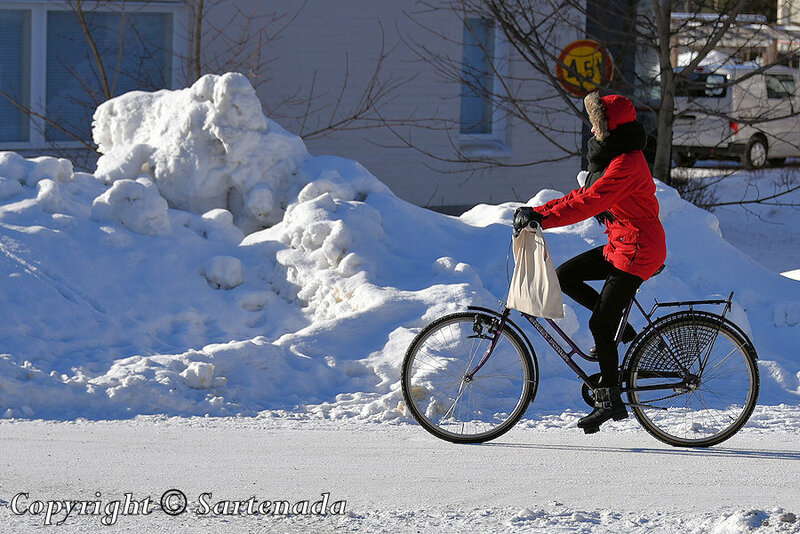 Nowadays when people talk about climate change, I raise my hat to those who bike to their job and for shopping. 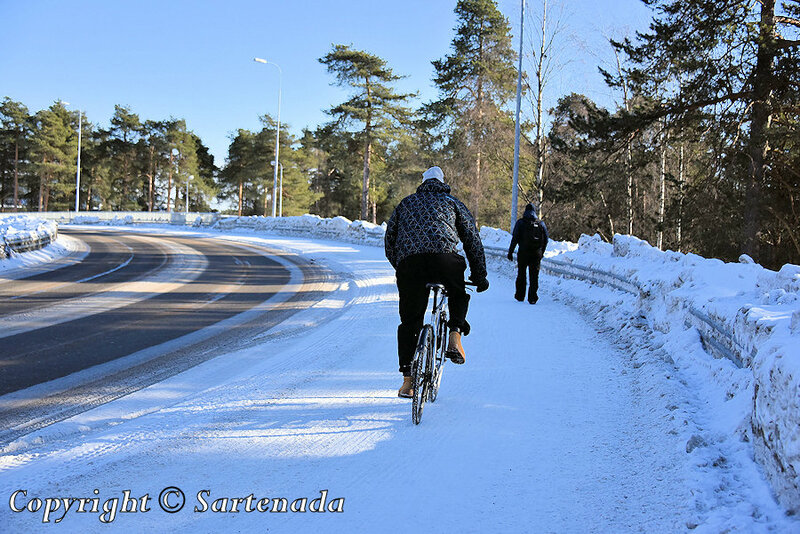 Of course, distances determine the possibility for cycling, not the cold! Thank You. Sounds great! I am glad when knowing that You have possibilities to have winter fun. Thank You. What a great joy it was to read Your praising comment. Thank You. Me encanta tanta ver tanta nieve. 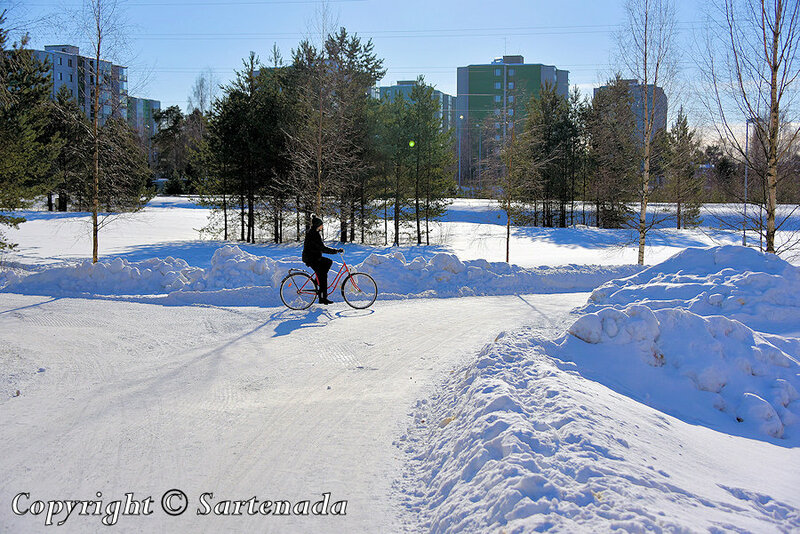 Oulu es la mejor ciudad de ciclismo de invierno de Finlandia. Claro que si, del ciclismo de verano también. Cuando es posible ir en bicicleta al trabajo o al comercio, es una acción climática. Muchas gracias. It is good to see so many people cycling. 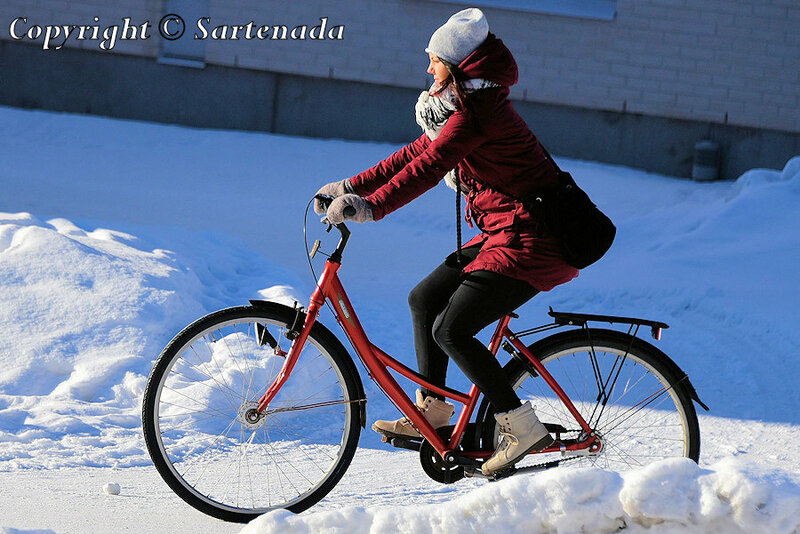 I think the longer the winter is and especially in cold climates, you will see more bicyclists out there all year round.trust you and your wife are well. It would be nice. Thank You leaving Your kind comment.